Set up your workplace exactly as it suits your needs the best. Connect your favourite peripherals to your laptop, tablet, PC or smartphone with new USB-C or Thunderbolt 3 interface. Expand your desktop to external HDMI monitor or connect projector or television with HDMI interface. The adapter supports 4K Ultra HD video with resolution up to 3840x2160@30Hz and stereo sound. 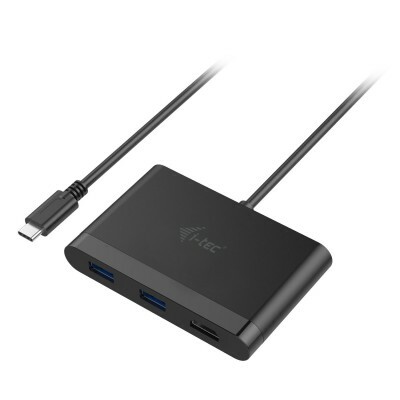 The adapter offers 2x USB 3.0 port for connecting your standard USB 3.1/3.0/2.0 devices and high-speed data transmission (5 Gbps), and NEW 1x USB-C Power Delivery / Data Port for charging laptops, tablets or smartphones with support for Power Delivery. To this port you can connect an original or a universal AC power adapter with USB-C connector, it ensures the constant charging of your laptop, tablet or smartphone during your work. This port also enables data tranfer, therefor can be used to connect modern data devices with USB-C connector (e.g. Ethernet adapter, USB Flash Driveâ€¦). However the port does not enable video tranfer.